To be effective in our efforts to prevent damage to Chaco from the fast accelerating fracking boom, we have to move quickly: the "public scoping phase" of BLM's procedures as described below began March 19 and ends May 28th (See the links at the end of this message for more information). The Solstice Project is distributing a short (4 mins) video alert "Fracking Threatens Chaco: a Sacred American Heritage." 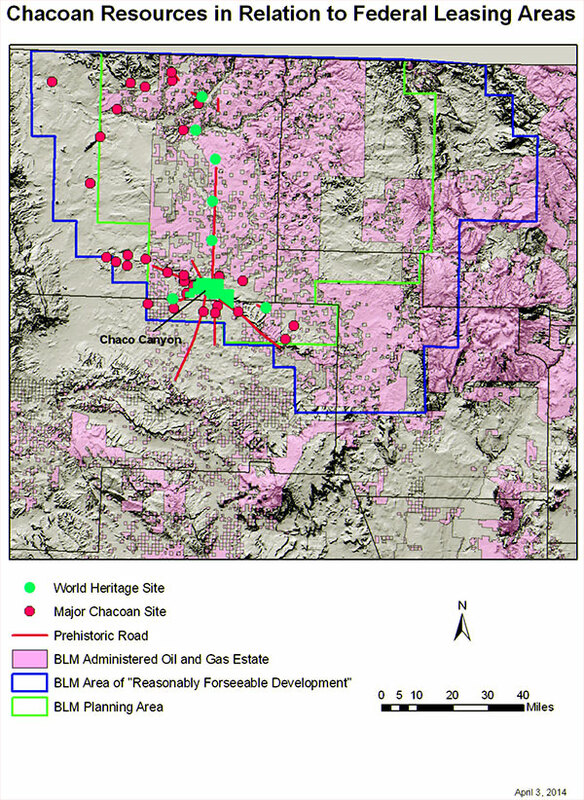 It shows Chaco roads and outlier sites in their vulnerable positions in the areas planned for fracking. John Roney and Anna Sofaer also wrote the following "Urgent Proposal to Record Chaco's Prehistoric Roads." Numerous archaeologists are now supporting it and we encourage you to add your voice. We include a map showing Chacoan roads and sites located in the region where BLM is facilitating greatly increased energy development. It also includes a list of the sites and a preliminary assessment of mineral ownership of each one. See map & list below. We propose that the BLM implement a comprehensive program of lidar and ground truthing in the 6.2 million acre area where they are they are proposing further energy development. We encourage you to endorse this statement, or better yet, to write in your own words to the BLM to develop a program of responsible action. Send your comments to blm_nm_ffo_rmp@blm.gov before May 28! Newsletter describing "Public Scoping Phase" of BLM Planning Process. Prehistoric roads in the San Juan Basin and beyond are an irreplaceable legacy of American history and a source of archeological knowledge essential to understanding the development of the Chaco Culture and its monumental works. The descendant Pueblo people and Navajo people who claim cultural affiliation with Chaco consider these ancestral roads to have spiritual significance. However, the San Juan Basin is on the verge of a blanketing of energy development, driven by new oil and gas extraction technologies. According to the Santa Fe New Mexican the resulting economic boom could rival that now taking place in North Dakota and Montana. The Bureau of Land Management (BLM) is beginning a radical amendment to its regional land use plan for the San Juan Basin. However, at present there are no plans to consider the inevitable impacts of oil and gas developments on prehistoric road systems. According to BLM scoping documents, the area of "reasonably foreseeable development" (RFD) includes a poorly studied region where prehistoric roads are abundant. Many of the 35 major Chacoan buildings found within the area of likely development are associated with known or suspected prehistoric roads --- most of which have not been adequately documented. Significant other undocumented road segments are undoubtedly present within this region. The process of identifying and documenting prehistoric roads requires comprehensive study with a variety of tools and specialized expertise. The normal approach to addressing impacts of oil and gas development under Federal law and environmental policy relies on pedestrian archeological surveys that are done at the time of actual development within the limited areas of specific proposals. Unfortunately prehistoric roads are almost never recognized during these inventories. The archaeological studies done as a part of the BLM Chaco Roads Project of the 1980s showed conclusively that identification and verification of prehistoric Chaco roads requires a phased process of analysis across large regions of concern, employing the best available remote sensing technology followed by specialized methods of ground-truthing. In addition, roads in general can be identified only by teams of archeologists and geomorphologists who have developed a special expertise to recognize their subtle and eroded vestiges. Recent lidar recording of Chaco's Great North Road showed it to be an extremely accurate, revealing, and cost effective way to document Chaco's prehistoric roads. To stave off the devastating impacts of oil and gas drilling as well as the infrastructure of roads and other developments that accompany this activity, lidar data should be acquired for all areas where prehistoric roads are possible. These data should be analyzed in conjunction with historic aerial photography to identify likely prehistoric roads, and appropriate field studies should be implemented to ground-truth the results. Following the precedent of its 1980s road study the BLM should implement this program to again meet their public responsibility to protect cultural resources. LA 1275 Slab House BLM Navajo Res. LA 126820 LA 126820 BLM Navajo Tribe? LA 40081 LA 40081 BLM Navajo Tribe? LA 40352 Padilla Well BLM NPS? LA 12759 Eagle Nest BLM Private? LA 2520 LA 2520 BLM Ute Mt. Res. LA 42282 Greasy Hill Pueblo BLM Allotted? LA 25903 Cuatro Payasos Navajo Res. LA 685 El Malpais Navajo Res. LA 51153 Escalon Navajo Res. LA 11594 Hogback Navajo Res. LA 89433 House of the Giant Midden Navajo Res. LA 18235 Willow Canyon Navajo Res. LA 8620 LA 8620 Navajo Res.? LA 100060 Chaco East Navajo Tribe? Squaw Springs Ute Mt. Res. †"Proximity" indicates BLM administered oil and gas estate within ca. 1 mile of site.